Kontakion in the Plagal of the Fourth Tone. O Champion General. The chaste Mothers of Basil, Gregory and John, let us praise with odes: Emmelia, Nonna and Anthousa, for they raised their children in piety, and together with them they rejoice and intercede for those who now cry out: Rejoice, O godly Synaxis. Rejoice, through whom the faithful are radiant. Rejoice, the consolation of saddened souls. Rejoice, vessel of the pious life. 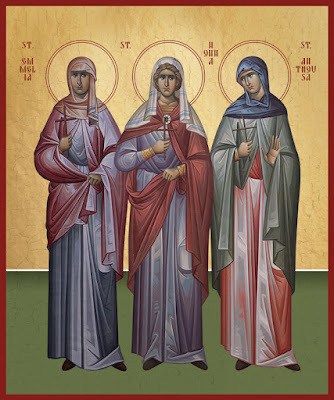 Rejoice, for you ceaselessly intercede to the Trinity. Rejoice, for your wisdom shown forth to the ends of the earth. Rejoice, through whom the Creator is glorified. 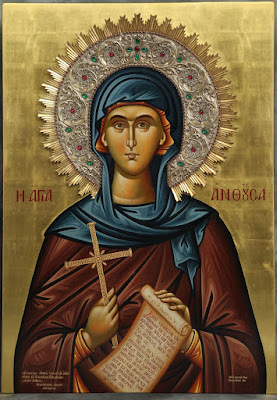 The multitudes of the Orthodox, beholding your life, and all your virtue that are most clearly revealed, cry out at your wondrous deeds surpassing nature, therefore they bend their knee and honor your person, O Mother, crying out: Alleluia. Rejoice, fervent prayer of faith. Rejoice, lily of the grace of virtuous life. Rejoice, most-fervent intercessor, bringing requests to Christ. 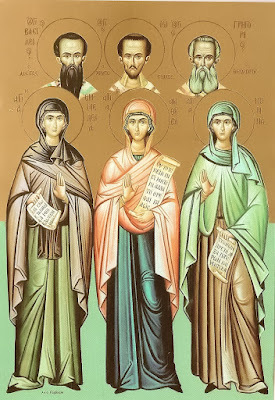 Rejoice, for you share the dwelling of the Venerable Saints. Rejoice, good worker of the Lord. 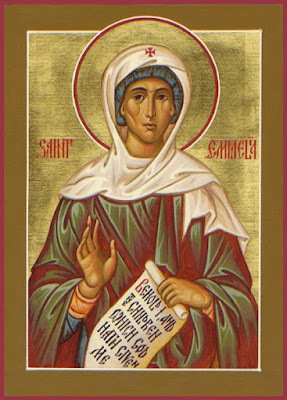 Divine power from heaven was sent by Him Who beholds all things, to enlighten your nous, full of knowledge and wisdom, in which God came to dwell, O Emmelia. Therefore, you ever hasten to pray to Him and ceaselessly chant: Alleluia. Rejoice, fruitful tree of the faithful. Rejoice, the most-divine praise of the faithful. Rejoice, wailing and pain towards the assaults of the demons. Rejoice, the baptismal fount of your spouse. Rejoice, you who drive away satan the deceiver. Rejoice, our entreaty towards Christ. 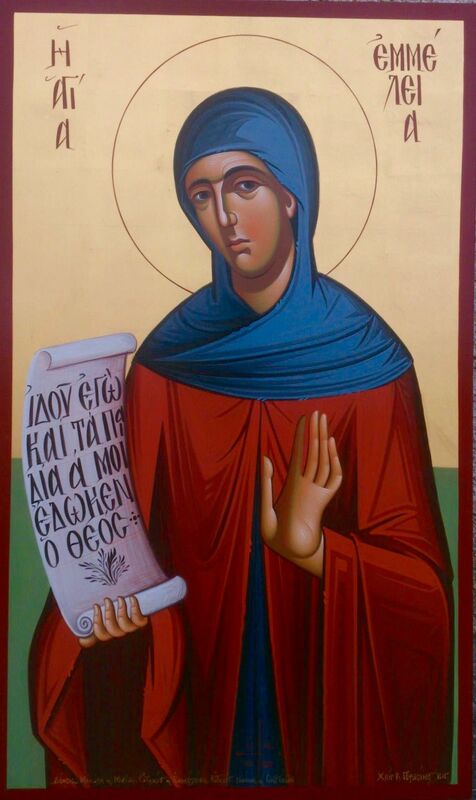 O Mother Nonna, you cast out troubling frenzy and dark and soul-destroying thoughts, cleansing your nous, and you teach mothers by both theoria and praxis to build up virtue and to be pleasing to God and chant: Alleluia. Rejoice, the crown of a pious home. Rejoice, good dwelling-place of the married life. Rejoice, for those on earth praise your life. Rejoice, you who bore the great weight of widowhood. Rejoice, brave example of tender love. Rejoice, through whom satan was deposed. O Mother honored by God, sacred Anthousa, you were shown to be a pillar of chastity for the Antiochians, therefore, Livanios the Rhetor praised you as a Christian mother, as we cry out: Alleluia. Rejoice, glory of the pious faithful. Rejoice, you who taught faith and piety in God. Rejoice, you who with faith drove away the assaults of the deceiver. Rejoice, you who make known meekness to the faithful. 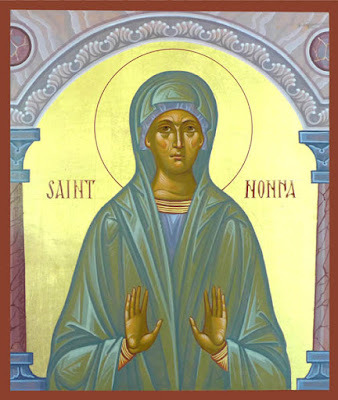 Rejoice, wise and motherly protection. 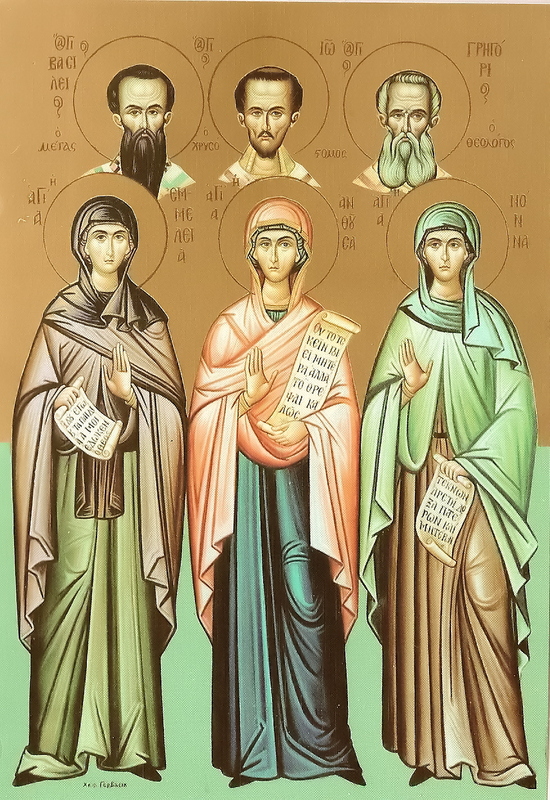 Your life became a preacher for Cappadocia, O Emmelia, wife and mother, therefore, together with your spouse, and your five children Saints, showing forth to the Church Basil the Great, while they chant unto God the hymn: Alleluia. Rejoice, healing for those ailing. Rejoice, the unspeakable glory of Nazianzus. Rejoice, vessel pouring forth myrrh, watering the faithful. Rejoice, the protector of children and mother of Saints. Rejoice, from whom spring forth divine streams. 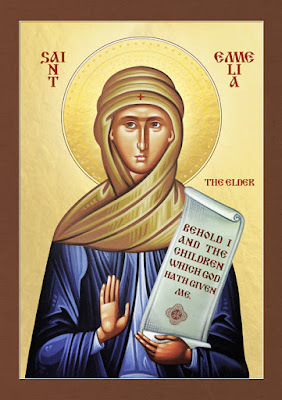 Remaining in church in prayer, O Nonna, God paradoxically loosed the bonds of barrenness, granting you three children straightaway, O Mother, and to Him Who granted them to you, you offered thanksgiving, crying out to the Fashioner: Alleluia. Rejoice, the mother of truth. Rejoice, the nourishment of prayerful mothers. Rejoice, most-radiant vessel which nourishes mortals. Rejoice, the guide and protector of those of godly mind. Rejoice, divine consolation for sinners. Rejoice, desired food of Paradise. 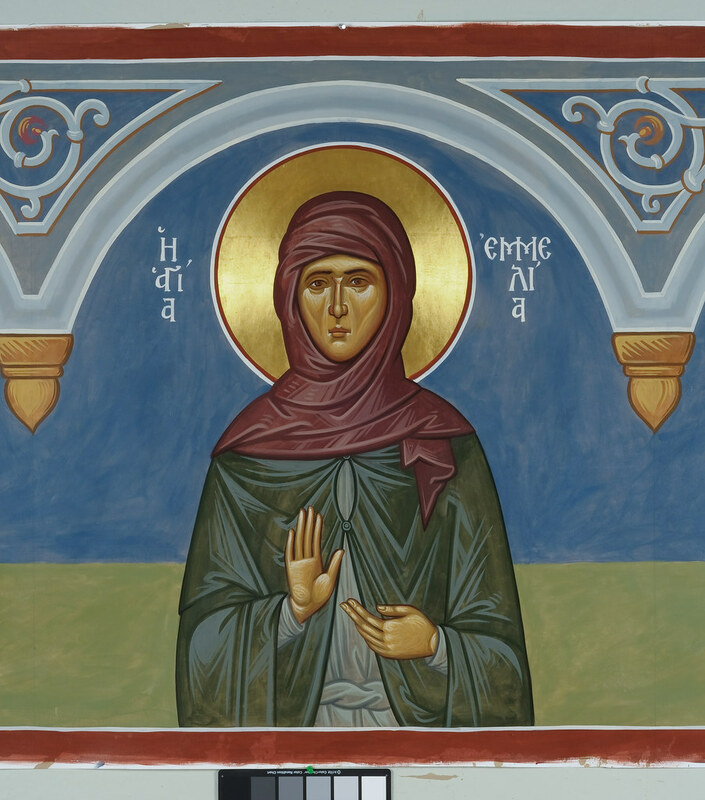 Truly strange are the awesome and godly things that we see in you, O Anthousa, as you lived your life in holiness and chastity, and with endurance withstood everything, fasting and casting out the multitudes of demons, and chanting: Alleluia. Rejoice, chaste pillar of chastity. 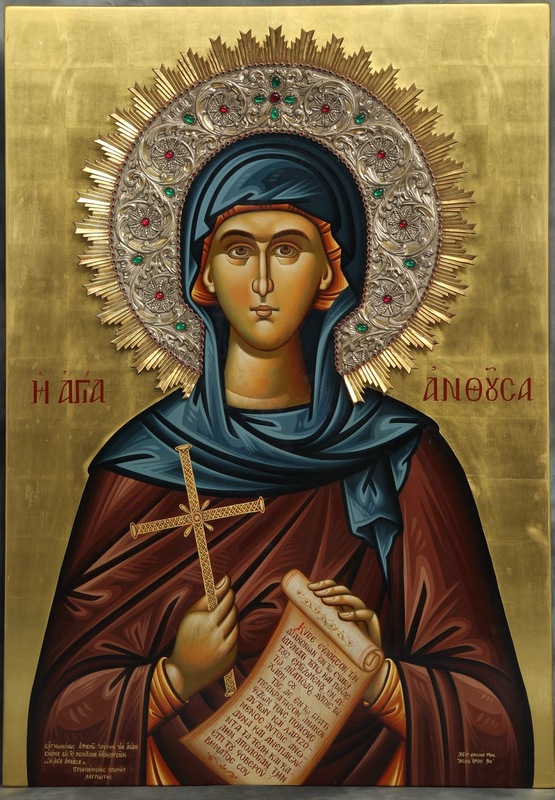 Rejoice, the exceptional praise of the Orthodox. Rejoice, mirror of the Spirit and dwelling-place in the heavens. Rejoice, you who led those deluded towards God. Rejoice, through whom are defeated those who war against us. Rejoice, firm exposer of satan. All natures of Angels were astonished, beholding your life in the flesh equal to the Angels, for God Who is unapproachable, gave you truly wondrous grace, O Nonna, and after your repose, He showed you forth to all the faithful as one working wonders, for those who cry out: Alleluia. Rejoice, vessel of His graces. Rejoice, ready blade against those of evil life. Rejoice, for in you the land of Antioch was gladdened. Rejoice, speedy deliverer of those who pray to you. Rejoice, deliverance of faithful men. Rejoice, you to whom was granted the Golden-tongued [Chrysostom]. 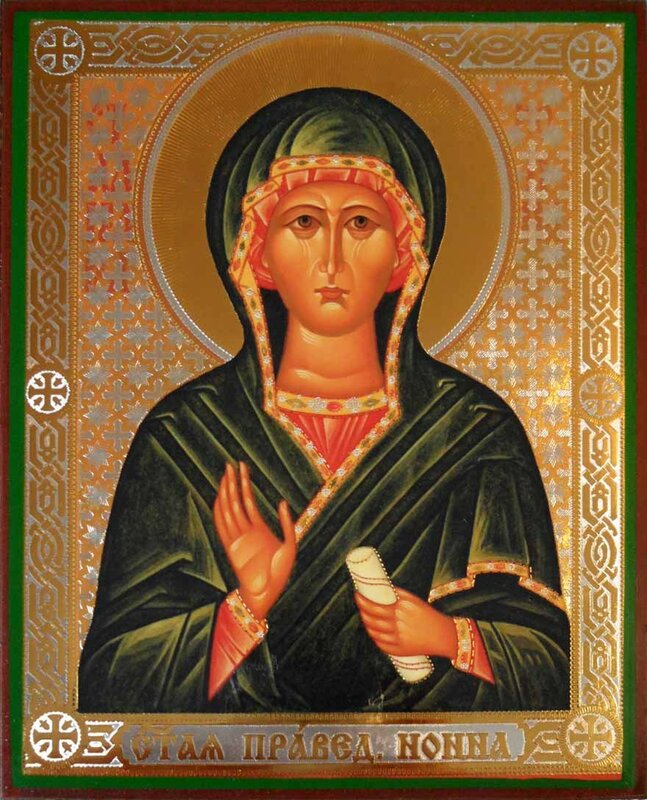 Save all through your prayers, O all-honored Mother, ceaselessly entreating the Lord, as we embrace your image with joy and all piety, and for the honor that we show you, you grant in return even greater things, for those who hymn you, O Anthousa, chanting: Alleluia. Rejoice, O gate of compassion. Rejoice, You who nursed them with godly milk. Rejoice, for you led them towards reverence to God in all things. Rejoice, mother and all-joyous nourisher of Saints. Rejoice, chaste nourishment of mothers. Rejoice, fervent intercession towards the Master. 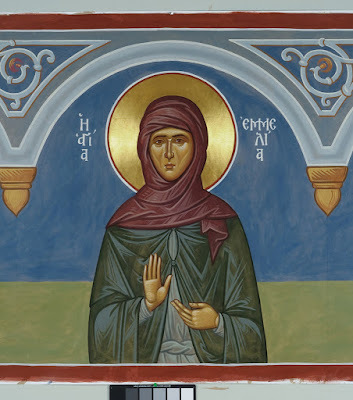 Receive these divine hymns, O Mother Emmelia, which we offer in faith, seeking that we be delivered from many temptations and trying circumstances, from passions and from the fires of hell, through your prayers to the Lord for those who cry out: Alleluia. Rejoice, the divine root of Nazianzus. Rejoice, for you wondrously redeem from the wounds of the soul. Rejoice, you who stand beside those who mourn with joy. Rejoice, seal of the faith in the Trinity. Rejoice, unfading strength of the faithful. O divine Emmelia, grant grace to those who in faith and hymns honor your icon, and grant to those with fervor holy and spiritual fruit, godly zeal for virtue, readiness towards repentance and a good defense before God, chanting: Alleluia. Rejoice, joyous pillar of chastity. Rejoice, treasury and vessel of divine grace. 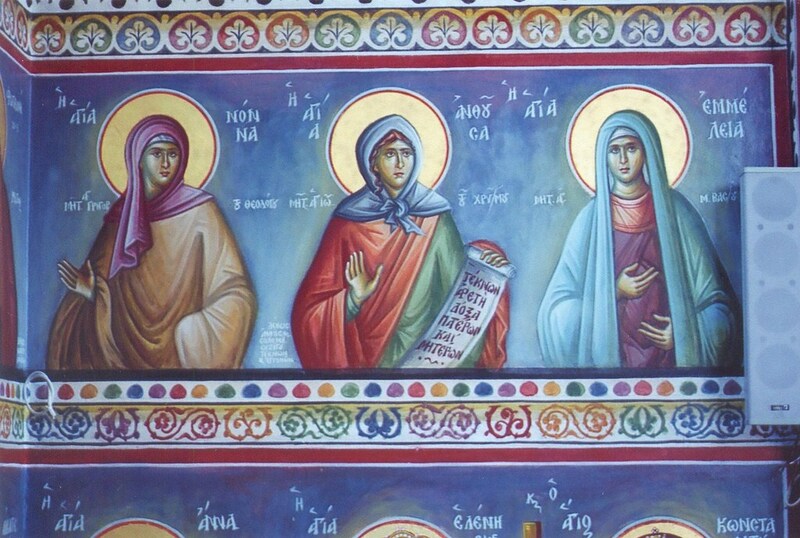 Rejoice, sacred boast of pious mothers. Rejoice, the greatly-fervent horn of the Orthodox. Rejoice, through whom Chrysostom has shown forth. Rejoice, the intercessor for the salvation of souls. 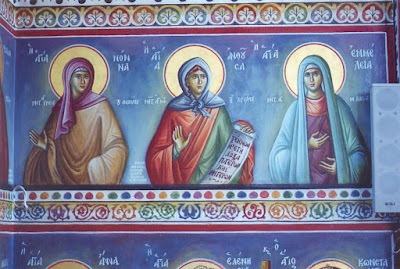 O choir of Saints, Anthousa, with Nonna and Emmelia, the lights among mothers (3), those who chant this ode to you, deliver from every trying circumstance, and intercede to God for the salvation of those who cry out in faith: Alleluia. Hi there! Could you tell me where you found this akathist? I would like to point the St. Emmelia Homeschool Community to this post, but need to know where the akathist came from first. Thank you! You have a lovely blog! The source link I included. The source blog did not include who the author is or where is the original source, and I have been unable to find it anywhere else online. "She put him on her shoulders and carried him..."
"The waters saw You, O God..."